Dr. Puffenberger received a B.A. in biology from Swarthmore College in 1987, and a Ph.D. in human genetics from Case Western Reserve University in 1996. He worked as an editorial assistant for Dr. Victor McKusick’s Mendelian Inheritance in Man (1987-1991), as a senior laboratory techician for Dr. Clair Francomano (1988-1991), and received his Ph.D. under the direction of Dr. Aravinda Chakravarti (1991-1996). He joined the clinic staff in January 1998, and became Laboratory Director in 2000. Dr. Puffenberger was raised in Elizabethtown, Pennsylvania. His father was an ordained minister in the Church of the Brethren and taught religion and philosophy at Elizabethtown College. His mother was born and raised in the Shenandoah Valley of Virginia and is descended from many Mennonite pioneer families. From an early age, Erik was interested in genealogy and spent many hours as a teenager at the Lancaster Mennonite Historical Society. This early interest developed into a strong passion for genetics, which was his favorite area of study at Swarthmore College. After college, he could not decide whether to attend medical or graduate school, so he chose to spend a gap year working in the field of genetics to help him select a career path. In 1988, he accepted a position with Dr. Victor McKusick as an editorial assistant for Mendelian Inheritance in Man, a catalogue of human genetic diseases and traits. That gap year at Johns Hopkins Hospital turned into a four-year experience which also included genetic research in the laboratory of Dr. Claire Francomano. One of the projects he worked on during this time was the first description of fibrillin gene mutations as a cause of Marfan syndrome. The research of Drs. McKusick and Francomano focused significantly on the Amish of Lancaster County. As such, Erik spent many hours compiling Amish pedigrees for these studies, and frequently accompanied the researchers on field trips to Pennsylvania and Ohio. These experiences helped cultivate his interest in founder populations. Although his parents began to doubt he would ever return to school, Erik enrolled in graduate school in 1991 at the University of Pittsburgh to study human genetics with Dr. Aravinda Chakravarti. He knew Dr. Chakravarti through collaborations with genetic researchers at Johns Hopkins, and Dr. Chakravarti had a large NIH grant to study the genetics of Hirschsprung disease. Ironically, as Erik began work in the laboratory, he discovered that a sizable collection of Hirschsprung disease families in the Chakravarti study were Mennonites from Lancaster County. He began to study them exclusively, and made dozens of field trips to Lancaster to recruit more families. Eventually, thirty-two families were used to genetically map and identify the cause of Hirschsprung disease in these families. During these studies, Dr. Chakravarti moved his laboratory to Case Western Reserve University in Cleveland, OH, where Erik received his Ph.D. in 1996. Following graduation, Erik did a brief post-doctoral fellowship with Dr. Chakravarti. It was during this fellowship that he became acquainted with Dr. D. Holmes Morton and the Clinic for Special Children. After several discussions, the clinic offered him a position as laboratory scientist and he began work in January 1998. By joining the clinic and leaving academic research, most of his peers and mentors warned that he was committing professional suicide. However, Erik recognized the potential benefits of applying molecular genetics to patient care, particularly in founder populations like the Amish and Mennonites. Since the clinic was not using any genetic technologies at the time, he quickly began to build the genetic capabilities of the clinic laboratory. In 2000, he assumed the role of Laboratory Director. 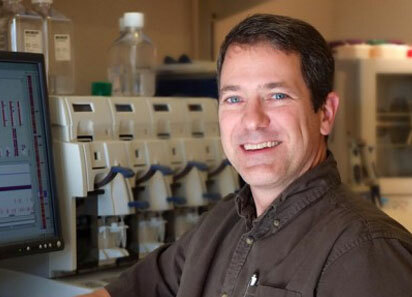 Today, his work involves implementation of molecular techniques for routine diagnosis, research into the genetics of isolated populations, development of molecular strategies for newborn screening, and identification of novel disease genes by genetic mapping and exome sequencing. The clinic represents a unique amalgam of cutting-edge genetic research and comprehensive medical care. This novel paradigm can be found in few places. I am proud and passionate about the work we do, the patients we help, the lives we impact, and the science we produce. There is never a boring day, and I am constantly challenged to learn and grow as a person and scientist. There surely is no geneticist on the planet who has a more rewarding career than I do. I am especially proud to work with talented professionals who tirelessly provide a medical home for patients with complicated and sometimes deadly disorders. I cannot imagine performing this important, meaningful work with a better group of colleagues.